Been meaning to update my blog more often than possible these past 2 weeks but 1st week really got me swamped while another one more week was having a streak of bad luck which resulted in me having to do a bit more extra work to produce results that are near to what I want or to do control damage. Anyway, enough about my un-awesome past 2 weeks. 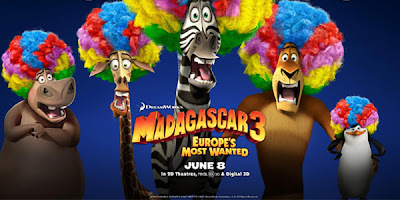 Madagascar 3 features again the zoo animals that we so come to adore namely: Alex the lion, Marty the zebra, Melman the giraffe, Gloria the hippo, and the rest of the adorable animated animals of Madagascar. 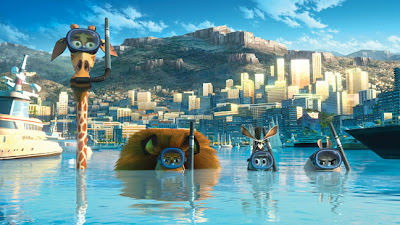 Alex missed his home where it's the city zoo of New York and after contemplating awhile, he rounded up the gang to go to Monte Carlo to get the penguins to fly them back to New York. In Monte Carlo, despite wanting to do things discretely, yet they failed to do so when they were trying to extract the penguins out of the casino and caused a scene where the animal control of Paris were alerted. 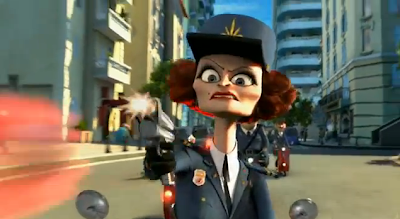 The animal control team of Paris is led by Officer DuBois who's a skilled hunter and animal tracker and is highly seeking a lion to be her head trophy on her wall. Hence, she's stopping at nothing to try and get Alex as her trophy. 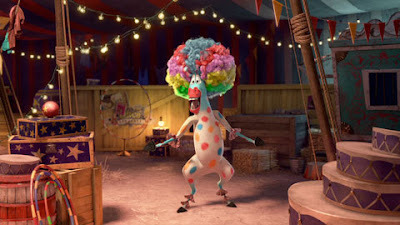 As the gang tried to escape from DuBois's pursuit, they ended up in a circus train pretending to be circus animals and traveled to the next destination for their performance. They soon learn that the next 2 performances will be crucial as they're trying to get a deal to perform in America by impressing the American promoter. This has resulted in the penguins buying over the circus from the humans but to their horror, they soon found out that they're no good in entertaining the audience and had to flee to avoid the angry mob. Alex soon heard the story of how they were lacking leadership ever since Vitaly, who used to be the star of the circus had lost his confidence in his act when an accident happened. And ever since then, the circus diminished into nothing without their star. That's when Alex decided to revamp the circus to make it a different show in order to impress the promoter so that he could get back to New York. In the meantime, DuBois is hot on the heels of the gang trying to get Alex as her prize. After the movie, Prometheus, I was hit hard and grew afraid to step into the cinemas for fear of a bad movie. But thanks to Madagascar 3, it restored back my joy in watching movies at the cinemas and am grateful that I was given the opportunity to watch this. I rate this movie 3.5 stars out of 5.